World at War is a tournament-style campaign game for Battlefield 1942 Forgotten Hope mod. Unlike a clan ladder, World at War players will participate in a simulated war, complete with commanding officers, divisions, and a grand strategy map showing the progress of the war from week to week. Think of it as a cross between a strategy board game and a first-person shooter, where you can immerse yourself in realistic WW2 environments and strategy. Now, if you are interested in playing some real Forgotten Hope, where you can count on the fellow players on your team. Where air/tank/infantry movements are coordinated, where you know why you are attacking a given Point. When you want to get that feeling that you're really 'there'. Then WaW is the right place for you. We have epic 12 hour battles every Saturday, 64 Players all coordinated through the WaW Teamspeak and the Forum. 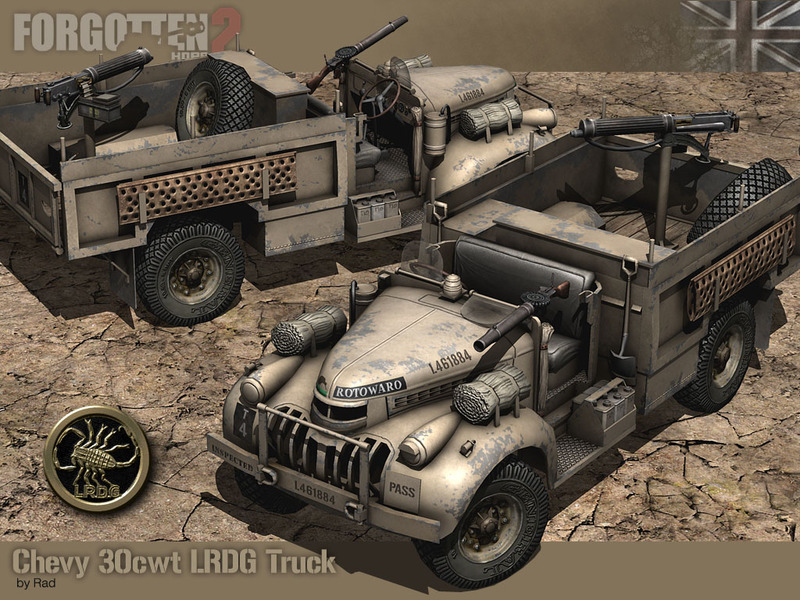 - Point System: We have established a comprehensive system that, much like many strategy games, assigns a point value to each piece of equipment on the field of battle --From the No.2 (9pts) to the King Tiger (3086pts) and everything in between. Each side picks their own equipment for the battle. And the best part? Using hotfixes for the maps, neither side knows what the other side has purchased for the battle until just minutes before the battle starts!!! - Historical Time Line: As the campaign progresses week to week, so do we move up the time line of World War II. As you move forward in a campaign, more and more equipment will become available as they did in real life. - Theater Campaign System: We have so many maps in six theatres of operation, that we have decided to break our campaigns up into 6 mini-campaigns; each focusing on one of our theaters of operation for 6 weeks. We are starting with North Africa and then will progress through the Battlefields of WWII. - New Custom Vehicles: Including the Achilles, M18 Hellcat, M16 quad .50cal, Ho-Ni, 3Inch US AT gun, deployable field guns for all sides, 17 pounder field gun, ISU-122, Easy 8, Nashhorn, StuH42, Zis AA, M3 Grant, and the Comet. How do I join ??? Just visit Battle for Europe Click on Register and your off. And remember, WAW is 100% FREE. If you have any registration problems just go here and our staff will sort you out ASAP. 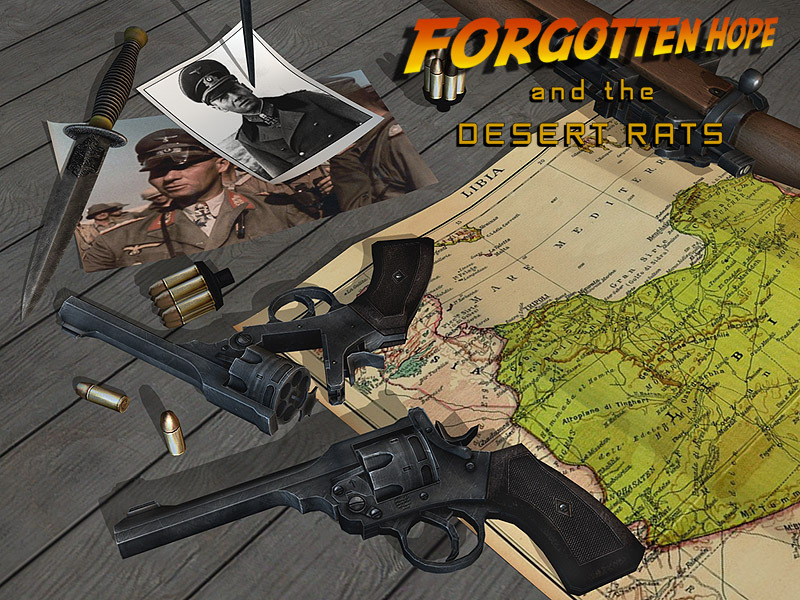 Before starting the showcase we have the honor to introduce 3 new Forgotten Hope 2 developers. We would like to welcome Arisaka joining the modeling department, Mr. Cheese responsible for mapping and zapfcreations who will give our coders a hand. The distinctive LRDG Chevy�s became emblematic of the LRDG�s ability to adopt any useful equipment were into their unusual arsenal. The very first of these were actually bought from a local Chevrolet dealer, some were borrowed from the Egyptian Army, and relatively few were acquired through regular army channels. All of these (like all later Chevys) had their cabs removed and were equipped with large sand tires. 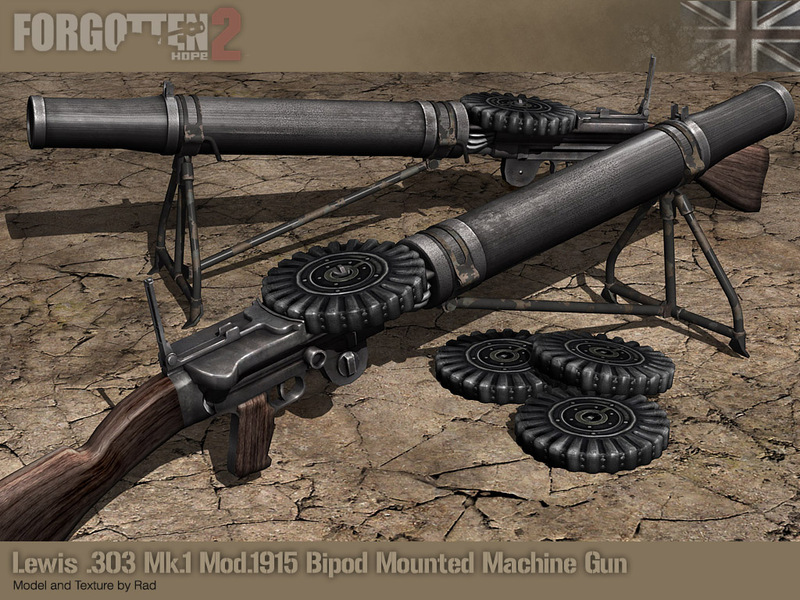 The version we present today is armed with Vickers and Lewis machine guns which will surely make Axis infantrymen go diving for cover. Of course the truck itself is not the only new item. The LRDG�s transports were also fighting vehicles, which sported a variety of the best weapons available. 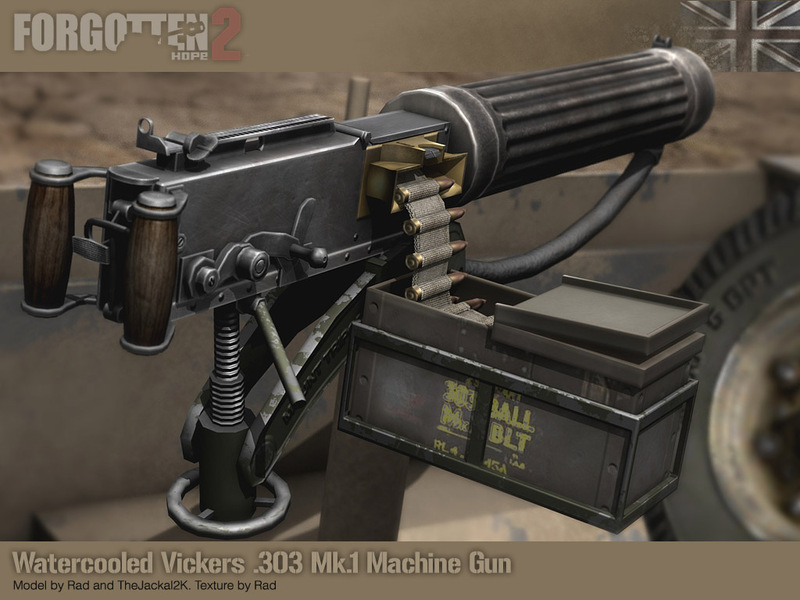 First we have the water-cooled .303 inch (7.7 mm) machine gun produced by the Vickers company, originally for the British Army of WWI. The machine gun typically required a six to eight-man team to operate: one to fire, one to feed the ammunition, and the rest to help carry the weapon, its ammunition and spare parts. Although heavy it was extremely reliable, so long as there was enough water to cool it. 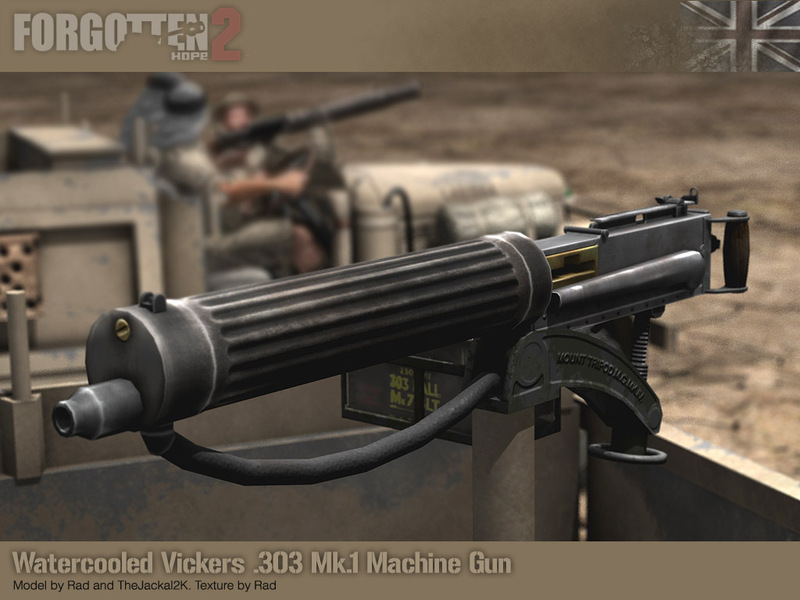 The Vickers was modeled by The Jackal and Rad. and skinned by Rad. Also visible on the Chevy Second is the Lewis .303 Mk. I, Model 1915. Although semi obsolete by the second world war, it was too heavy (although far lighter then the Vickers), to be useful as a light machine gun, and had been largely replaced in that role by the Bren. It was mainly used mounted on vehicles, especially aircraft, but found a new home with the LRDG who respected its ruggedness and reliability. The Lewis was modeled and skinned by Rad. 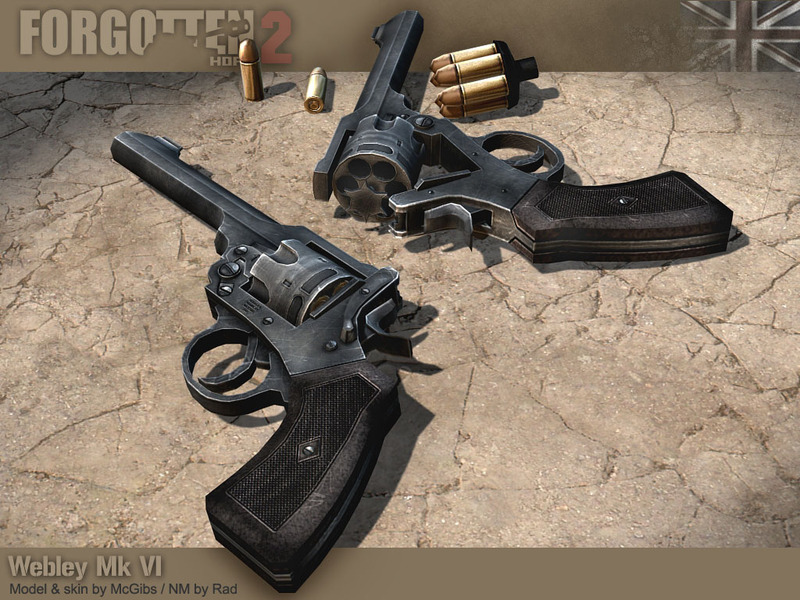 Last but not least we present the Webley Mk VI revolver made by McGibs. This 6 round .455 revolver is yet another weapon of World War 1 vintage. By World War II, it had been officially replaced by the Enfield No 2 Mk I revolver, but due to shortages, many Webleys continued in service. The hard-hitting Webleys were especially popular with the New Zealand troops that formed the nucleus of the early LRDG. It was also manufactured by RSAF Enfield under the designation Pistol, Revolver, Webley, No 1 Mk VI. As a final treat, we have a cinematically themed wallpaper created by Lobo.